[Stephpalm] had carved a pumpkin for the first time in two decades. Unfortunately, the neighborhood squirrels were all too pleased with her work and devoured it. Her original goal for the jack-o’-lantern was to have its lights controlled over the internet. These hungry critters inspired another project instead – The Jack-’o’-Lantern Squirrel Early Warning System. There have been hacks that have dealt with pesky squirrels before, such as a trap and an automatic water turret, but they didn’t have the ability to post to social media like this system does. The system consists of a Spark Core, a passive infrared (PIR) sensor, and a piezo buzzer. When the motion sensor is triggered the buzzer sounds, scaring away any peckish creatures lurking nearby. [Stephpalm] used an NPN transistor and 1k-Ohm resistor to provide enough current to drive the buzzer. All of these components were connected using jumper wires and a breadboard that sits on top of the pumpkin. As a nod to her original idea, [stephpalm] then created “Pumpkin Watch Code” and loaded it into the Core. It posts preset messages to a Twitter account every 45 minutes of inactivity or whenever a pesky squirrel is detected. The messages can be personalized for anyone who wants to make one of these themselves. We wonder if it would be better to place the breadboard inside the jack-o’-lantern and carve out a couple of holes on top for the PIR sensor’s wires to come out of. That would offer some protection from the elements and prevent it from getting knocked over. We think this project could be adapted for many other uses. After the break, see a video of the system in action! Wireless sensor networks are nothing new to Hackaday, but [Felix]’s wireless PIR sensor node is something else entirely. Rarely do we see something so well put together that’s also so well designed for mass production. For his sensor, [Felix] is using a Moteino, a very tiny Arduino compatible board with solder pads for an RFM12B and RFM69 radio transceivers. These very inexpensive radios – about $4 each – are able to transmit about half a kilometer at 38.4 kbps, an impressive amount of bandwidth and an exceptional range for a very inexpensive system. The important bit on this wireless sensor, the PIR sensor, connects with three pins – power, ground, and out. When the PIR sensor sees something it transmits a code the base station where the ‘motion’ alert message is displayed. The entire device is powered by a 9V battery and stuffed inside a beautiful acrylic case. With everything, each sensor node should cost about $15; very cheap for something that if built by a proper security system company would cost much, much more. Our favorite holiday is just around the corner, so there’s no surprise in seeing a few builds to scare children turning up in the tip jar. [Greg] also loves Halloween and apparently puts on a good show – he always uses a fog machine on his porch on All Hallow’s Eve, but triggering it at the right time is always a pain. This year, [Greg] decided to build a motion-sensing fog machine. His machine featured a wired remote with a light to signal when the fog machine is ready and a button to start the pump. This remote runs at 120V AC, but [Greg] figured he could stick a small USB phone charger in the remote and power an ATtiny85 microcontroller. The actual circuit is just a piece of perfboard, a large, old relay from Sparkfun, and a PIR sensor [Greg] picked up last year. Whenever the PIR detects movement, the Tiny85 activates the fog machine for 5 seconds and disarms itself for another 10, until it sees movement again. Just the thing for a little interactive ambiance for [Greg]’s Halloween display. It’s less than 5 days away from Halloween and the projects to scare small children are pouring in. [Noel] sent in his robotic Halloween mask he’s been working on, and the only way his build could be any better is by placing it underneath a child’s bed. [Noel] took the mask he used last year and stuffed a few styrofoam craft balls inside to ‘fill it up.’ Two LEDs and a PIR sensor were fitted into the eyes of the mask and a few more electronics added to the brain. A servo was fitted to the base of the project to turn the head left and right. The build uses a Gizduino Arduino clone with an Adafruit Wave shield. After a little bit of wiring up the LEDs, PIR sensor and neck servo, [Noel] had a bit of coding ahead of him. He ran into a problem with the WaveHC and Servo libraries because they both used the same timer. After finding a another software-based servo libraries, he had a reasonably terrifying project to put in front of a bowl of candy. Check out the video below for a demo of [Noel]’s work. A year ago [Lochie] bought an Airwick automatic air freshener, and while he thought it was a cool gadget, the freshening spray and the novelty ran out in short order. The device collected dust in his room for some a while until he recently unearthed it, and noticed that a perfectly good PIR sensor was looking him in the face all this time. 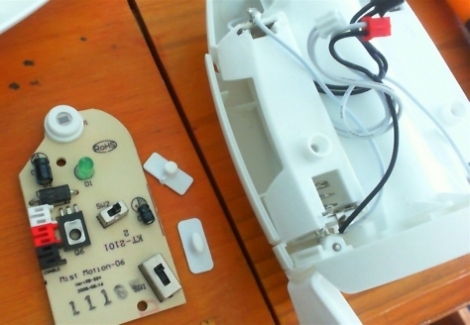 He disassembled the air freshener, then set out to figure out how he could interface with the PIR sensor. After finding a helpful Instructable on the topic, he had full access to the sensor’s signals, allowing him to easily wire it up to an Arduino. He decided it would be fun to trigger some simple music any time someone entered his room, so he encoded a short bit of the Super Mario Brothers theme in RTTTL, as he explains in the video below. It’s a simple little hack, but [Lochie] is pleased with it, and we imagine that he likely has a long list of other creative ideas in mind for his newly discovered PIR sensor.